Adult scoliosis treatment in the past rarely incorporated a scoliosis brace due to its rigid design which caused muscles in the back to weaken and compliance of wearing the brace was low due to how unconformable it was to wear and you can not conceal it. With the invention of the dynamic corrective SpineCor scoliosis brace by two Montreal doctors: Dr Charles Hilaire Rivard and Dr Christine Coillard, adults have a new option with this soft brace that fits under the clothes. The SpinceCor brace is a soft brace that moves freely with the patients movements which enables them to do all there normal activities while still wearing the brace. Scoliosis brace for adults main objectives are to reduce pain and improve patient posture; bracing will NOT improve scoliosis curves in adults surgery is the only option. Some patients are not good candidates for surgery, so bracing is another option for these patients. 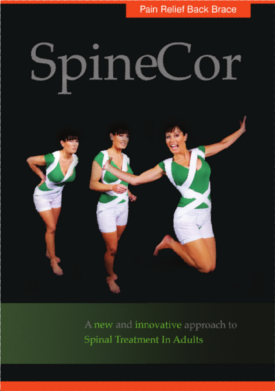 Treatment for scoliosis in adults using the SpineCor scoliosis brace is based on corrective movement on the spine from the elastic bands. By reinforcing the muscles surrounding spinal column will reduce the pressure on the vertebrae which will provide pain relief to the patient. The brace will help recondition the structural back muscles to become stronger and help maintain proper positioning, which will reduce the compression on the spinal column. Bracing is not cure for adult scoliosis, but as shown to be a tool in slowing or stopping the curve from progressing. Scoliosis in adults has no cure, but with the right treatments and a healthy life style, individuals can live a pain free and functional life.